Appam – the Queen of Kerala is a fermented flat bread made out of Rice and Coconut. In Tamil, it is known as “Aappam“. The Srilankans prefer to call it as “appa” or “hopper“. Appam is specially popular among the Syrian Christians of Kerala and some say that Appam was adapted from Jewish people who migrated to Kerala. Times have changed and I would say, Appam has become an identity of all Keralites. There are numerous variations of Appam like Palappam, Velayappam, Kallappam, Vatayappam and so on….. I have always tried to find out the difference between Palappam, Velayappam and the likes but I realized that the names and recipes for Appam vary from region to region in Kerala. Back Home, my mom used to make 2 kinds of Appam – one was Palappam and the other Kallappam. I guess these 2 were the familiar ones in and around Kottayam. 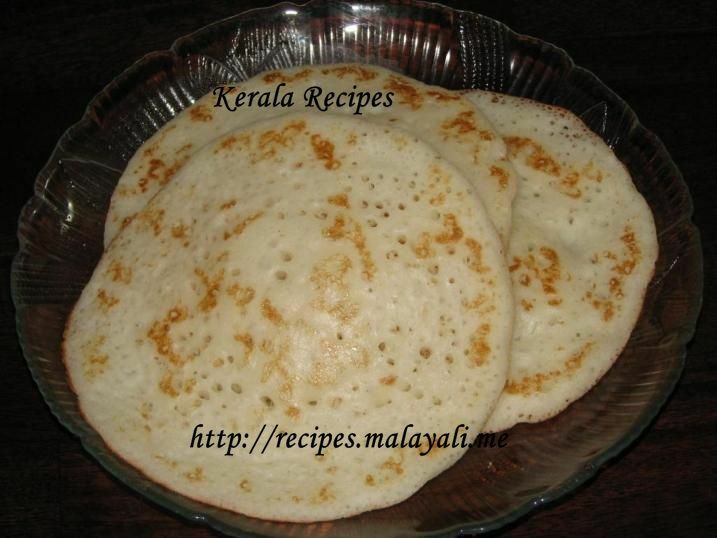 When I moved to college, I discovered Vellayappam, which is how it is known in some Northern Regions of Kerala. Later, after moving to US, I learnt from my friends about the simple and humble Plain Appam, with no frills and thrills. Finally, here is how I like to classify Appam – but again, the nomenclature will differ from person to person. Kallappam – Traditionally, made using Toddy but people substitute it with Yeast. It’s made by grinding Rice, grated Coconut, shallots and Cumin. Kalappams are made on a flat pan similar to pancakes. Velayappam – It’s more or less like Palappam – batter is made by grinding together grated Coconut and Rice. Coconut Milk is not used. Appam – The simplest of all which is made using Rice Flour, Yeast and Coconut Milk. Here is the recipe for making Appam using Rice Flour and Coconut Milk. It’s pretty easy as you don’t have to soak rice, grate coconut or grind anything. Again the suggestion to use Rice Flour came from my dear Mom-In-Law. Later, when I discussed with some friends, even they told me the same. Well, this Appam tastes really good and is the easiest of all but for authentic Palappam or Kallappam taste, you will have to grind rice and can’t use Rice Flour. Appam tastes excellent with Mutta Curry/Egg Curry. You can make this Appam on a flat tava, pan or griddle similar to Dosa or you can make flower shaped Appams in a Palappam Chatti (deep round pan used for Palappams). For making Rava Kurukku (Semolina Paste) which is a thick paste, take 2 cups of water in a saucepan and add 2 tbsp of rava (semolina). Bring it to a boil stirring continuously. Reduce the heat to low and continue stirring. When the mixture changes to a thick paste, remove it from heat and allow it to cool. If you are in a hurry and do not want to keep the batter overnight for fermenting, then you can use any Rapid Rise Yeast. I use Fleischman Rapid Rise Yeast for quicker fermentation. If you are using Ordinary Active Dry Yeast, then check out the Note section at the end of this page for instructions. In a big bowl, combine 2 cups of Rice Flour, 3 tbsp Sugar, cooled Rava Kurukku (Semolina Paste), 1 tsp Rapid Rise Yeast along with 1/2 cup Coconut Milk and a pinch of salt. Add around 1/2 to 1 cup water or more and whisk everything to form a smooth and thick batter. The batter should be thick because after fermentation it will rise and become thinner in consistency. Leave the batter in a warm place for around 3-4 hours and allow it to ferment. Just before preparing Appam, you can add 1-2 tbsp of sugar, if you like your appam to be sweet. If the batter is thick, add around 1/4 cup coconut milk to the batter. The final batter should have a consistency similar to that of Idly Batter. Whisk everything well. Heat a flat Non Stick Tava or griddle and pour a ladle full of batter. Do not spread the batter with the ladle. Cover with a lid and allow it to cook on medium heat for around 2-3 minutes. Skip this step if you are using a griddle. Turn the appam and cook the other side till it is slightly brown. Serve these Appams with Egg Roast, Chicken Curry or any Spicy vegetable curry. You can make atleast 8-10 medium sized appams with the given measurement. For making Palappam with the same batter, just before preparing palappam, add 1-2 tbsp of sugar and 1/4 to 1/2 cup of coconut milk to the batter and mix well. The batter should be loose in consistency similar to that of Dosa batter. 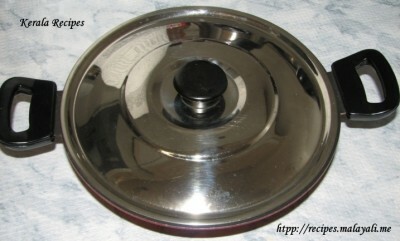 Pour a ladle full of batter into a Palappa Chatti (deep round pan used for Palappams) and swirl the pan lightly, spreading the batter to the sides of the pan. Cover with lid and allow it to cook for around 3 minutes on medium heat. When the center of appam is done and the edges start detaching, remove the palappam carefully from the pan. Do not flip palappams. If you like the edges or laces to be golden brown, add more sugar to the batter. In a small bowl, combine 1 tsp yeast and 2 tsp sugar in 1/2 cup of luke warm water. Keep it aside for 10-15 minutes and allow it to rise. Mix it with the remaining ingredients in Step 3 and keep the batter over night (8-10 hours) for fermentation. I know this is a strange question for a malayali but is there a gluten free substitute for rava in the kurukku? My MIL is gluten intolerant and I would like to make appam for her. Oh I made your Chicken Roast last night, it was very yummy. You can grind 1 cup of cooked rice and combine it with the rice flour instead of making Rava Kurukku. Hope this helps. Please let me know if it worked. Hi! 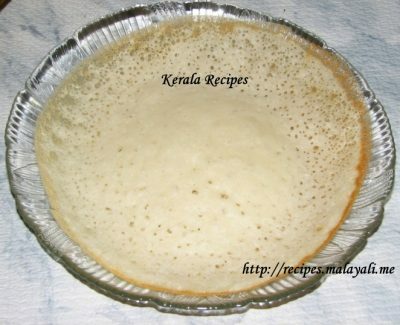 You have described Appams very well, but for those not from Kerala/Tamilnadu, we need more specific info as to the time of soaking or allowing the batter to ferment. Those aspect is not covered. I think you should incorporate suitable changes to the write-up and that will be comprehensive. 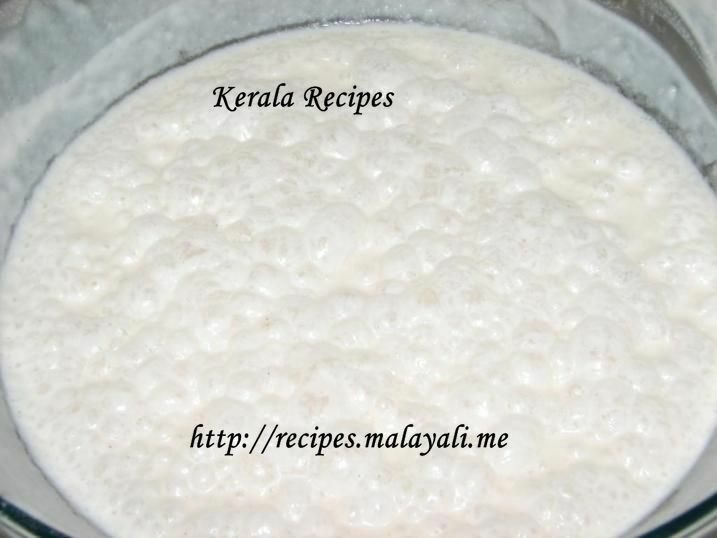 I have used Rice Flour in this recipe for appam. Hence, I have not mentioned the time of soaking for rice. If you are using Rapid Rise Yeast, you need to ferment the batter for around 3-4 hours. Whereas, if you are using ordinary Active Dry Yeast, you need to keep the batter overnight (8-10) hours for fermentation. Hope this helps. i havent tried the recipe yet but just wanted to know if we can fridge the batter to use when convenient ordoes it have to fresh batter each time. it is really to time the process accordingly. You can refrigerate the batter for 3-4 days. Before making appams using refrigerated batter, leave the batter outside at room temp for half an hour. With the given measurement, how may people can I serve? How many appams? You can make atleast 10 medium sized appams with this measurement. 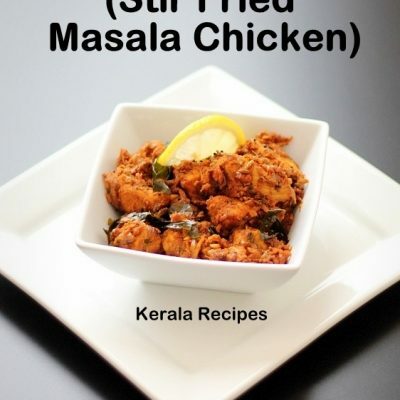 I tried out this recipe n it was a big hit for me…my hubby really loved it…thanks a lot n God bless! very nice explanation about appams! It seems to take more time as compared to dosa as you told we have to cook for 3 mins both sides. Total how much time it took you to make say 10 appams? and can you also tell the recipe of kadalai curry? Thanks.. If you are making Appams on a flat tava or griddle, it will take around 2-3 minutes for the first side. The second side will be done in seconds. If you are using a Palappam Chatti, you just have to cook one side for around 3 minutes. You don’t have to flip the Palappams. Hope this helps. Your recipe is good. I would like to share my knowledge about Palappam. Word “PALAPPAM” itself means something with real milk not coconut milk. Thanks for sharing the info. Traditionally Kallu (Toddy) was used for making Appams but now we have to do with Yeast for fermentation. 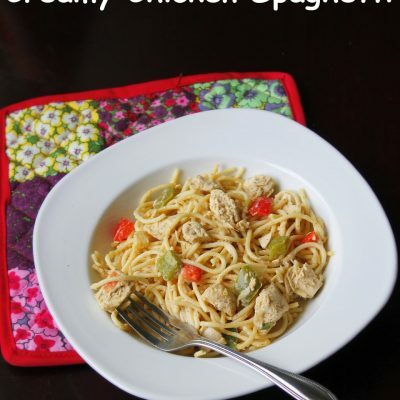 I tried this recipe and it came out very well…. It was the first time I prepared Palappam by myself, otherwise i was using the ready made mix. Once the ready made powder i bought got finished, I was wondering how to make it here in Canada and your recipe really helped me…Thank You…. I want to know whether coconut powder can be used for coconut milk.. I always use Canned Coconut Milk as it’s thick. You can try Coconut Powder to make Coconut Milk but it shouldn’t be too watery or else the Batter may become runny. Good recipes! Thanks, its of great help!! I could not find the dry yeast, its difficult here as I am in a remote French town. I found this 42g big cube of baker’s yeast (wet). I put the half of it into the batter that u suggested. Looks like the yeast way too much for the batter. What do I do? The yeast and sugar should be dissolved in luke warm water. If the water is cold or hot, it will not rise. If the yeast has not expired, fermentation should take place within 10-12 hours even if you are staying in a cold country. If the weather is freezing, try leaving the batter overnight in a conventional oven with the light switched on. Hope this helps. I really adore ur site. U r such a great cook n u explain each n every portion clearly.. really appreciate ur inborn talent in cooking…. God Bless U dear.. I am writing from my heart…. I have tried lots of appam recipes in different cooking blogs n beleive me.. only urs came out successful… Once again, thnx a lot…. I got recently married n i am new to cooking…. n also my mom passed away few years back.. n so there is no one to guide me… only ur blog helped me to cook delicious food for my hubby.. I never took pain to leave a comment on any blog.. but if I leave urs, it will be a big crime…. Thank u so much Jisha, I have one small doubt… I got 11 appamS with above palappam recipe… what should I do inorder to make double number of palappams.. I mean like 20 appams.. Please reply….. I know its a stupid doubt… but plz do help me.. God Bless U.. Thank you for the lovely feedback. For making 20 palappams, just double the ingredients. 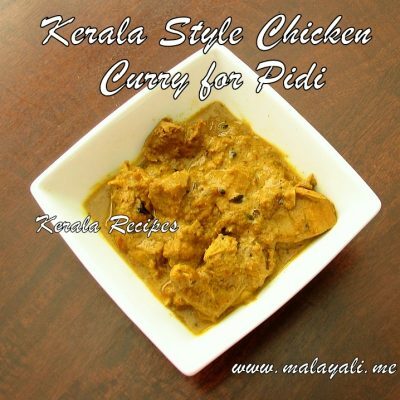 Hi Jisha… This is a fantastic website with such great info on malayali food! I love it!! Can you please tell me the method of making palappam by grinding rice and coconut? 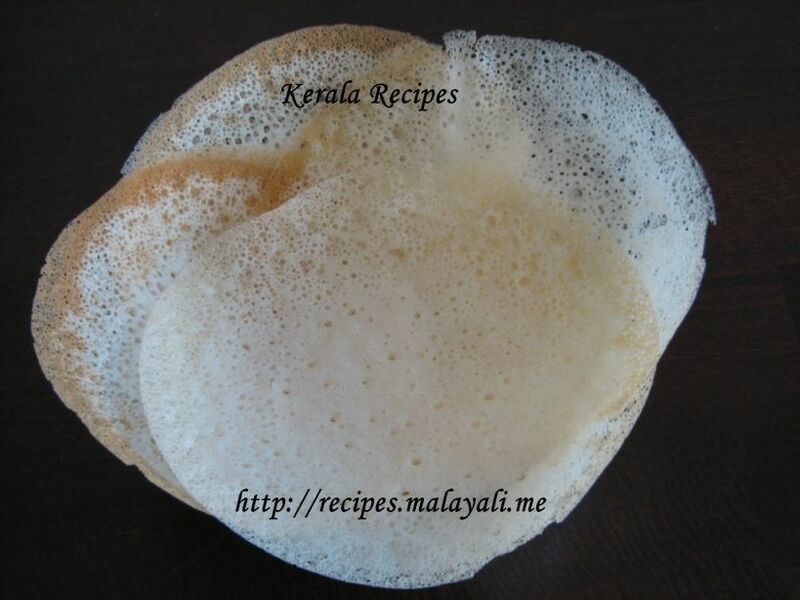 I would really like to learn the authentic way of making appam… please can you help? I will post the traditional recipe for Palappam soon. Thanks for the very usefull site.In Canada, we get only Gluten free rice flour. Will the Apams come nicely if I use that flour?Please advise. I haven’t tried Gluten Free Rice Flour for making appams. Probably you can try using 1 cup of Rice flour just to see what the outcome is or if you have a grinder/mixie, you can grind raw rice and make appam the traditonal way. Hope this helps. The way you explain about making appam is amazing.Thank you for sharing this wonderful recipe with others. I am a SriLankan Tamil. Back home my mom used to make yummy appam. Your recipe is very close to my mom’s.I would like to share my knowledge about how appam is called in Srilanka. You need to use non-fried rava. 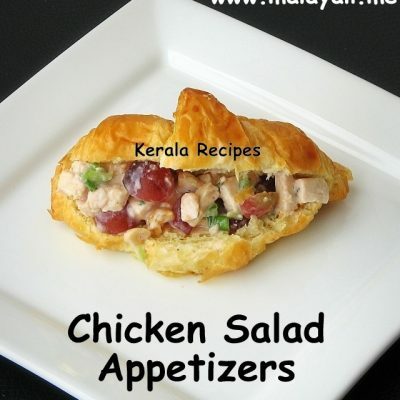 Hi Jisha, thank you for your wonderful recipes. How do you make toddy to use instead of yeast? Thanks 4 the recipe. I have a doubt. Are we supposed to use fried rice flour for appam? You can use roasted rice flour for a better taste thought it isn’t absolutely necessary. 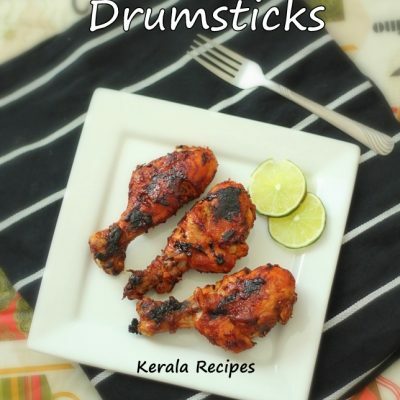 Really nice recipes…I wud like to experiment all those.. I hav a doubt….the rice flour used is raw or roasted? ?